Some time ago, Blender’s Collada Exporter was in a very bad state. Especially the export of rigged meshes for OpenSim and compatible target worlds has been broken for a long time. Since Blender 2.62 the export basically works again. But we have taken some serious amount of time to further improve the entire module. this is a report about what has been made so far, what you can expect from Blender 2.64 and what we are planning for the future. Please note, the current development version is available from GrapahicAll.org . Please ensure that you grab a build based on revision r47979 or newer. We still have a couple of days to fix bugs. So please feel free to grab it and test it, and report your bugs to the blender.org patch tracker. All active Modifiers will be applied in a non destructive mode. That is, the modifiers will be applied to copies of the meshes. thus you no longer need to apply your modifiers before exporting. that is now down in the background for you. Hint: Some Modifiers provide a Preview mode and a Render mode with different mesh settings. We now suport both modes when applying the modifiers. Hint: This option also includes the application of Shape keys! So now you can export your meshes with the current shape key configuration baked in. Hint: You will want to enable this option in most cases. When this option is enabled, then all children of the selected objects will also be exported regardless of their selection state. Hint: You now can select only(!) 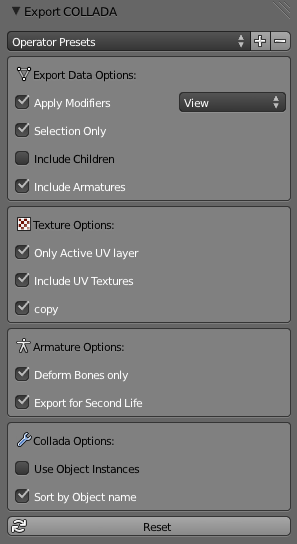 an armature, then in the exporter enable “include children” then all rigged meshes attached to the armature wil be exported. When this option is enabled, then all armatures related to the selected objects will also be exported regardless of their selection state. Hint: You now can just select your objects, then in the exporter enable “include armatures” then the armature data is also exported. When your mesh contains multiple UV layers, then Blender exports all layers by default. This option allows you to only export the active UV layers. Hint: You will want to always enable this option when you export for OpenSim and compatible worlds. That’s because the SL Importer does not know what to do with multiple UV layers. So please ensure that your models active UV layers are set as you want, then export with this option enabled. Blender supports 2 ways to texturise your objects. By using material based image textures. While the material based image textures offer much more flexibility, using surface textures can be done very quickly without need to first render textures. Until now blender did only export material based image textures. The new option allows to directly export render results. Hint: Some mesh importers for OpenSim and compatible worlds can only import textures with static meshes. As soon as you add rig information the texture import gets broken. When you export images either material based image textures or surface textures, then we create absolute file references in the export file. But id the “Copy” option is enabled, we will create copies of the images instead and place the copies besides the export file. In that case the file references are made relative. Hint: For OpenSim and compatible targets you will always want to export with “Copy” enabled. the SL Importer does not allow absolute file references. When this option is enabled, then the exporter strips all non deforming bones from the exported armatures. this option is useful when your armatures contain control bones which are not actually part of the charater skeleton. For example you can now export the Avastar rig with this option enabled. The resulting exported rig is compatible to OpenSim and compatible worlds. But please note the restrictions further down. In Blender you can reuse the same mesh for multiple Objects. This is named “object instanciation”. When you enable this option, then Blender will propagata object instantiation to the Collada file. Hint: For OpenSim and compatible targets you will want to disable this option, because the Importer behaves wrong when object instances are used. Especially Object names will be broken after Import to OpenSim and compatible worlds. The export order of data is bound to internal object order and it can not be influenced in a reliable way. this option ensures that the Geometry nodes and the Object nodes are both exported in alphabetical order. Hint: For OpenSim and compatible worlds you will want to enable this option, because the Importer relies on the sort order of exported objects when it comes to match the LOD files. This option is very special. In fact some issues with bone orientation are calculated differently when this option is enabled. This is only relevant for rigged meshes. I hope that this option will eventually be replaced by something more meaningful (and still compatible to OpenSim) Hint: This option is only important when you want to export rigged meshes. For static meshes it just does nothing at all. We have solved a couple of long standing Bugs for various import and export problems. By now we can reimport Mesh objects with a reasonable quality. Improve Blender’s Collada importer, especially for rigged meshes. Goal: Reimport rigged meshes with no deviations. More testing with other target systems. Maya may be an option. We have added an OpenSim Preset (available from the preset drop down box at the top of the Collada export panel). this preset is what you will want to use in almost every case when you plan to export to openSim or compatibleworlds . Please refer to the above detailed description for further information. While you can now remove non deforming bones during export, you still have to provide the correct bone configuration. So your rig must contain at least the 21 main bones of the SL Avatar. And the bone names must still be exactly as defined by Linden Labs. every rigged mesh item still needs the 21 weight groups for the main bones of the SL Avatar. If only one group is missing, the SL Importer will reject the file. You must ensure that each vertex shows up at least in one of the 21 main bone weight groups. otherwise you get holes in your meshes (invisible parts).